"Sound is the forgotten flavor sense," says experimental psychologist Charles Spence. In this episode, we discover how manipulating sound can transform our experience of food and drink, making stale potato chips taste fresh, adding the sensation of cream to black coffee, or boosting the savory, peaty notes in whiskey. Composers have written music to go with feasts and banquets since antiquity—indeed, in at a particularly spectacular dinner hosted by Duke Philip of Burgundy in 1454, twenty-eight musicians were hidden inside an immense pie, beginning to play as the crust was opened. Today, however, most chefs and restaurants fail to consider the sonic aspects of eating and drinking. That's a mistake, because, as we reveal in this episode, sound can affect how fast we eat, how much we're prepared to pay for our meal, and even what it tastes like. This experiment, for which Charles Spence won a highly coveted IgNobel prize in 2008, came about almost by accident. Spence was working with a big company to see whether they could use the recently discovered "parchment skin" illusion to trick customers' brains into believing that their clothes felt even softer after coming out of the washing machine. It works this way: if you muffle the sound of your hands being rubbed together while you're rubbing them, your brain assumes that they must be smoother than they are. That's because your brain combines the audio information with the tactile sensation and assumes because there's less noise, there's less friction, and hence softer skin. This idea—that if you change the input in one sensory realm, you can influence perception in another—is called crossmodal sensory interaction, and it lies at the core of Spence's research. "Food and drink are among life's most multisensory experiences," Spence pointed out, so it's perhaps hardly surprising that it occurred to him that the parchment skin illusion might work in the mouth, using food rather than clothing. He recruited 200 volunteers willing to eat Pringles for science, and played them modified crunching sounds through headphones, some louder and some more muffled, as they ate. And he found that he could make a 15 percent difference in people's perception of a stale chip's freshness by playing them a louder crunch when they bit into it. "The party version" of this trick, according to Spence, was developed by colleagues in the Netherlands and Japan. Volunteers were asked to crunch on chips in time with a metronome, while researchers played crunching sounds back, in perfect synchrony, through their headphones. All was well until the researchers replaced the crunching with the sound of breaking glass—and "people's jaws just freeze up." Have a bag of chips that's been sitting around too long? Here's the sonic boost they need. 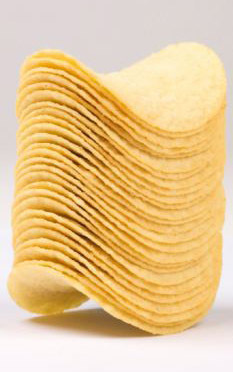 And—thanks, science!—here's a soundtrack to make your perfectly fresh chips taste stale. As far as breaking glass goes, we can't condone inflicting that kind of trauma—you're on your own. According to Spence, you should be able to guess. The human ear is sensitive enough to pick up on the slight change in a liquid's viscosity as it changes temperature. Hot water is less viscous than cold, which means that the splash it makes when it hits the bottom of the glass or mug is a tiny bit splashier—and thus higher pitched. This finding has practical applications in advertising, for example, as well as drinks dispensers—your soup or coffee could be made to seem piping hot, or your soda even more cool and refreshing. But Spence also suggests playing with it: blindfolding guests and handing them a cold drink while playing the sound of a hot one. The result? With the sound, "we've put the idea in your mind, the expectation that it's going to be very hot," he explains. "And then when you put it to your lips and it's suddenly cold, you'll be shocked, but you probably won't know quite why you should be shocked." So far, we've focused on the sound that food makes, either in your mouth or in the glass. But Spence's recent research has focused on something much more abstract and mysterious: an implicit association between particular kinds of sound and tastes. The idea that different scents, tastes, and flavors might correspond to different musical notes has a long, if speculative, history: in nineteenth-century London, perfumer Septimus Piesse created a scent scale in which middle C was matched with rose, while an octave lower was geranium. 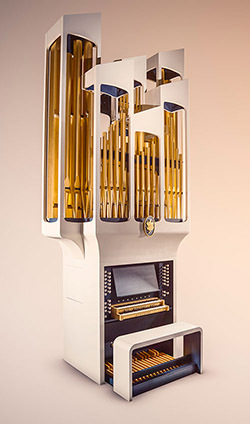 In the following decades, novelists picked up on the idea and invented fictional liqueur flavor keyboards (Joris-Karl Huysman's Against Nature), a "pianocktail" machine (Boris Vian's L’Ecume des Jours), and a scent organ (Aldous Huxley's Brave New World). On the left, a diagram of the pianocktail created by Florica Vlad; on the right, a mechanical version of the pianocktail built by musician Géraldine Schenkel. According to Spence, the first scientist to test the concept, however, was Kristian Holt-Hansen, working in Denmark. Using Carlsberg's lager and Elephant beer as his two test beverages, he demonstrated that people consistently matched a lower-pitched tone (510-520 Hz) to the lager, and a slightly higher note (640-670 Hz) to the more vinous Elephant beer. He then found that when he played the matching sound to people as they consumed the appropriate beer, they rated it as tasting better. As unlikely as it sounds, Canadian scientists successfully replicated the experiment in 1984, with the confusing addition of grapefruit and dill pickle, which matched even higher pitched sounds (1016 Hz and 1394 Hz, respectively). That was the state of the science when Charles Spence decided to test the connection between pitch and taste in 2012. Using a bittersweet toffee specially created by chef Heston Blumenthal, Spence and his colleagues showed that people perceived the toffee as ten percent more bitter while listening to low-pitched notes, and ten percent sweeter when their headphones were filled with higher-pitched music. Subsequently, Spence says he's tried this experiment on people from all over the world, and found a similar correspondence. You can try it at home with some bittersweet dark chocolate and these two soundtracks. The first one is sweet-enhancing, the second will boost bitter. But, although the effect is real, the mechanism behind it is more elusive. Listen to this episode of Gastropod to understand how and why sound affects our experience of food—and how we might use that science to redesign the experience of eating. From chefs playing with sonic seasoning to enhance our dinner, to the perfect soundtrack for whiskey, we explore the way our brains combine sound with our other senses to create flavor. This is the second in a two-part series exploring the relationship between sound and food: don't miss the previous episode of Gastropod for much more on the experimental history and emerging science of acoustic agriculture, from the perfect bovine playlist to the lost rhythms of Southern farming. And, if you like what you hear, please support our work with a donation of any size. Charles Spence is head of the Crossmodal Research Laboratory at Oxford University. His recent book, The Perfect Meal: The Multisensory Science of Food and Dining, co-authored with Bettina Piqueras-Fiszman, is a fascinating review of everything we know about the way all the senses interact to affect our experience of food. As promised, we've uploaded the sounds from the episode, for all your sonic seasoning needs! In addition to the sounds above, Charles Spence shared the sound of dry and soft hands rubbing together that inspired the sonic chip experiment, and the seascape, farmyard chicken, and sizzling bacon sounds he used in his first collaboration with Heston Blumenthal. He also sent along the sound of champagne, Prosecco, and soda water being poured into a flute. And, finally, you can hear some of Symphony in Blue, the music composed for the Flavor Conductor to accompany whiskey, here (we aren't allowed to share the full mp3, sorry). The Flavor Conductor. Photograph by Rob Lawson.